As March 2nd 2013 dawned, excitement rose throughout the country as the new season of the J League was about to begin. Fans had exhausted themselves reading the endless previews and predictions, digested the main comings and goings in the squads, admired or been disgusted by the new season's kits, and mostly laughed at the often, frankly horrendous club slogans, it was time finally for the main event to begin. Omiya Ardija's winter break had been relatively quiet. The main action being the loss of midfielder Keigo Higashi to FC Tokyo, and the return of the successful loanee, Komoto to J2 bound Vissel Kobe. The latter an admirable sign of loyalty to his home town club as he chose to play for them in J2 rather than fight out another season with the big boys as part of Omiya Ardija's defence. Kobe have rewarded him by making him captain I believe. His partnership at the back with Kikuchi had been a key part of the Squirrels' survival in the top flight, and so Ardija fans will be looking keenly to see how youngster Shohei Takahashi fits in after his arrival from J2 outfit Tokyo Verdy, where he played 111 matches and scored 9 goals. As for Higashi, he leaves the club after two seasons of promise which never seemed to be quite fulfilled. FC Tokyo are getting a player full of potential and young enough to have time to develop and fulfill it. Being a smaller fish in a bigger pond might suit Higashi at this point in his career and I expect to read good things about him in the future. 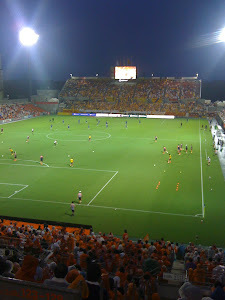 The first match out of the hat for Ardija was an Orange derby with the team from Shizuoka, Shimizu S Pulse. I was lucky enough to receive a pair of free tickets for this game and I found myself for the first time ever sitting behind the goal next to the away supporters. Whether they had not taken up their full application, or were never given the opportunity to, I don't know. In any case, I actually thoroughly enjoyed myself in these "extra" home seats. There were no queues to buy beer or for the toilets, and with 30 minutes to go, we could easily find a good seat to view the match from. Luckily at Nack 5 there is little sign of trouble between opposing sets of fans and the segregation barriers looked relatively flimsy but thankfully were not needed. A poor policeman was employed to stand there and stare at us all the game, which he did with due Japanese diligence, or perhaps he was a baseball fan! Omiya started with Zlatan and Novakovic up front, Cho, Kanazawa, Aoki and Watanabe in midfield and with a defence of Shimohira, Kikuchi, Takahashi and Watabe. It was a very windy day, and the strength of the wind increased steadily throughout the match. In the first half Ardija attacked towards the away end and after a slow opening period, they started to make some nice breaks and showed some ability to spread the ball well between the midfield and attack. However real chances were few and far between and our first chance came from a mistake by Bare as he passed the ball backwards and Zlatan exploited the error to set up Novakovic, whose shot was too weak but the S Pulse goalie, Hayashi could only parry it to Zlatan, whose attempt was blocked by Hayashi. In the first half S Pulse seemed slow out of the blocks and their only real chance was a header from Ishige which was saved by the feet of Kitano. At half time I sat in my seat, thinking Ardija were fairly comfortable, well organised and starting to play some nice football. Yet the suspicion that S Pulse had not really started yet, was a worry. At the start of the second half all the S Pulse team were out and in their team huddle before even one player from Ardija had made it on to the pitch. I am sure that Ghotbi's halftime teamtalk had been swift and urgent. Go and get out there and play like I know you can. Expecting an S Pulse onslaught as the gusting wind picked up in strength, fans of the Shizuoka team were at first to be disappointed though as yet again it was Ardija who put the better moves together and exposed some weaknesses in the flanks of S Pulse's defence. Cho, whose passing was not always perfect, but whose running on and off the ball on either wing was evident in the first 70 minutes of this match, easily got down the left wing on the 56th minute and turned the S Pulse defender to cross the ball towards Takuya Aoki, only for the hapless Jong A Pin to beat Aoki to the ball and turn it into his own net. This goal suddenly brought S Pulse and the match blazing into life as Ishige hit the bar with an effort from outside the box. In the 65th minute, Ardija extended their lead, with another goal which came from the left wing, this time Novakovic was the player to turn the opposition's defence far too easily and be the provider, and there again was Aoki, and this time he made no mistake striking the ball home sweetly from just outside the box. 2-0 up with 25 minutes to go and chances still coming. It seemed as if we would be taking our first 3 points of the season at the first go. Novakovic's miss when through clear on goal from a Cho set up, and poor control from Cho himself when he was bearing down on goal, would in the end prove crucial. S Pulse finally turned up for real in the last 20 minutes and fought back to level the match through goals from firstly their main danger player, Ishige on the 74th minute and then Uchida in the 84th minute. S Pulse looked the stronger and fitter as both teams went for the winner, but neither team could and it ended 2-2. Takahashi should have done better with his attempted header to clear the ball for the first goal, and the second goal was a calamity as the free kick evaded the efforts of both the defenders and then Kitano to clear it. The main talking point toward the end of the game involved Jong A Pin again, who made a reckless challenge and a clear foul right on the edge of the penalty box. The freekick was given but the S Pulse defender did not receive any booking from the referee. Then Jong A Pin showed dissent to the referee by arguing with him over the distance the wall was and marking out the paces for him. Here, the referee rightly showed him a yellow card, but Jong A Pin should have found himself back in the changing rooms with 2 yellow cards to his name. The other S Pulse players behaved equally as poorly as they backchatted to the referee and delayed the free kick a noticeable length of time. Unfortunately the eventual free kick taken by Novakovic was poor and went directly into the wall. Earlier in the second half their South Korean midfielder was fouled just over the halfway line. The referee correctly gave a free kick. But Min Soo made an awful meal of it, waving around that he had been elbowed when replays clearly showed that nothing of the kind happened. When the referee immediately told him that he was wrong, the player bowed his head in apology. And so he should, attempting to get your opponent wrongly booked or sent off is one of the worst things to see on a football pitch and should be ironed out of the game. These kinds of behaviour from the S Pulse players do them and their coach Ghotbi no favours. It's a shame as their football is usually very pleasing to watch. A draw then for Ardija. It seems so disappointing after letting a 2 goal lead slip. However there are some real positives to take from this game. The overall shape of the team worked for me, and if the players get sharper over the next games as we must expect them too, then things look positive for the Squirrels. The defence was looking reasonably stable until the final section of the match and Verdenik is a coach who can work well with Kikuchi and Takahashi to give their partnership a chance to succeed. Novakovic and Zlatan will want their finishing to be better, and certainly there is a question about Zlatan's fitness who was substituted in the second half. Cho looked lively on the wings and when he makes his passes and crosses more telling and perhaps make them a bit quicker to catch the runs of the front pair, he will go on to achieve much more now Higashi has left the club. Aoki in midfield had a fantastic match. He was my player of the season last year. Lots of his midfield work often goes unnoticed but it is so valuable as he supports both the defence and then the midfield as we push forward. His name will get noticed because of his involvement in both our goals, but it's his unselfish play elsewhere that is really of note. As for S Pulse, in Ishige they have a very exciting player to watch, but their fans must be worried that he does not join the ever growing exodus of Japanese youth to European shores. In Bare, they have a striker who will give defenders something to think about and I would expect him to find the net quite a bit. Their defence does not look so good on this showing. Time will tell if this was a hiccup or the sign of a major weak point. Next up for Ardija is a match against the other team from Shizuoka, an away trip to Jubilo Iwata as we try to avoid the curse of Maeda. The team that Jubilo Iwata and Japan striker Ryoichi Maeda has scored his first goal of the season against in the last 6 seasons has ended the season by getting relegated. It's a quite remarkable and unusual statistic, and unfortunately for Squirrels fans he didn't score in Jubilo's opening game, a creditable 1-1 draw away at Nagoya Grampus. Ardija fans will be looking for the team to get the defence into the form it showed in the last 11 games of the 2012 season, and for Zlatan and Novakovic to have the scoring boots on, oh and to keep Maeda quiet of course!